Our laboratory has developed DNA-crosslinked polyacrylamide hydrogels, a dynamic hydrogel system, to better understand the effects of modulating tissue stiffness on cell function. Here, we provide schematics, descriptions, and protocols to prepare these hydrogels. Previtera, M. L., Langrana, N. A. Preparation of DNA-crosslinked Polyacrylamide Hydrogels. J. Vis. Exp. (90), e51323, doi:10.3791/51323 (2014). Mechanobiology is an emerging scientific area that addresses the critical role of physical cues in directing cell morphology and function. For example, the effect of tissue elasticity on cell function is a major area of mechanobiology research because tissue stiffness modulates with disease, development, and injury. Static tissue-mimicking materials, or materials that cannot alter stiffness once cells are plated, are predominately used to investigate the effects of tissue stiffness on cell functions. While information gathered from static studies is valuable, these studies are not indicative of the dynamic nature of the cellular microenvironment in vivo. To better address the effects of dynamic stiffness on cell function, we developed a DNA-crosslinked polyacrylamide hydrogel system (DNA gels). Unlike other dynamic substrates, DNA gels have the ability to decrease or increase in stiffness after fabrication without stimuli. DNA gels consist of DNA crosslinks that are polymerized into a polyacrylamide backbone. Adding and removing crosslinks via delivery of single-stranded DNA allows temporal, spatial, and reversible control of gel elasticity. We have shown in previous reports that dynamic modulation of DNA gel elasticity influences fibroblast and neuron behavior. In this report and video, we provide a schematic that describes the DNA gel crosslinking mechanisms and step-by-step instructions on the preparation DNA gels. Static and dynamic substrates are two categories of biomaterials that were developed to study the effects of tissue elasticity or stiffness on cell function. Static substrates are unable to change their physical properties after they are fabricated and/or once cells are plated. Polyacrylamide (PA) gels were the first two-dimensional, static substrates that were synthesized for mechanobiology investigations 5,17. PA gels are easy to prepare, inexpensive, versatile, and can be fabricated with a broad range of elastic moduli. Although these technical advantages make PA gels a commonly applied substrate, static substrates are not indicative of the dynamic nature of the extracellular matrix (ECM) and surrounding cellular environment in vivo. For example, the ECM undergoes stiffness alterations as a result of injury, development, or disease. Dynamic substrates are therefore favored as tissue-mimicking substrate models in mechanobiology studies 22,24,25. Numerous synthetic, natural, two-dimensional, three-dimensional, static, and dynamic biomaterials have been developed to mimic tissue stiffness 1,3,6,16,23,26. Some dynamic substrates require heat, UV, electrical current, ions, and pH changes to alter their mechanical properties 2,4,7,8,12,15,16, but these stimuli can restrict the hydrogel’s bio-application. DNA-crosslinked polyacrylamide hydrogels (DNA gels) are dynamic two-dimensional elastic substrates. DNA crosslinks allow for temporal, spatial, and reversible modulation of DNA gel stiffness by addition of single-stranded DNA (ssDNA) to media or buffer 9-11,13,14,18,21. Unlike the aforementioned dynamic gels where stimuli are applied for modulation of elasticity, the DNA gels rely on the diffusion of applied ssDNA for the alteration of elasticity. Therefore, the upper gel surface, where cells are grown, is the first area modulated because the rate of elasticity modulation is dependent on the gel thickness. DNA gels are similar to their PA gel counterparts in that they have a polyacrylamide backbone, however the bis-acrylamide crosslinks are replaced with crosslinks composed of DNA (Figure 1). Two ssDNAs (SA1 and SA2) hybridize with a crosslinker strand (L2) to make up the DNA crosslinks of the gel. SA1 and SA2 have distinct sequences that both contain an Acrydite modification at the 5´ end for effective incorporation into the PA network. For preparation of the gels, SA1 and SA2 are individually polymerized into a PA backbone and, subsequently, the polymerized SA1 and SA2 are mixed together. L2, the crosslinker, is added to the SA1 and SA2 mixture. The L2 base sequence is complementary to both SA1 and SA2 sequences and L2 hybridizes with SA1 plus SA2 to form the DNA crosslinks. Initial, DNA gel elasticity is determined by both L2 concentrations and crosslinking (Tables 1 and 2). DNA gels containing equal stoichiometric amounts of L2, SA1, and SA2 are the stiffest gels because SA1 and SA2 are 100% crosslinked by L2 (designated as 100% gels). Lower concentrations of L2 result in a lower percentage of DNA crosslinking and, therefore, softer DNA gels. Gels as low as 50% crosslinked (designated as 50% gels) have been constructed 9-11. Figure 1. DNA gel crosslinking and uncrosslinking schematic 9-11,13,14,18,21. Step 1: SA1 (red) and SA2 (blue) are individually polymerized into a polyacrylamide backbone (black). After polymerization, SA1 and SA2 polymerized solutions are mixed together. Step 2: L2 (green) is added and hybridizes with SA1 plus SA2 to form the crosslinks of the gel. Step 3: R2 hybridizes with the toehold of L2. Step 4: Toehold hybridization of R2 propels the unzipping of L2 from SA1 and SA2. Unlike PA gels, DNA gels can stiffen and soften after synthesis. For that reason, cells grown on DNA gels can be subjected to dynamic stiffness alterations. To stiffen cell-adherent gels, L2 can be added to the culture media of low percentage gels to increase the percentage of crosslinks. To soften cell-adherent gels, L2 can be removed to decrease the percentage of crosslinks 10,13,21. L2 has an additional toehold sequence at the 3´ end to allow L2 to uncrosslink from SA1 and SA2 (Table 1). Removal of L2 is accomplished by hybridization of a reversal strand called R2. R2 is complementary to the full length of L2 and hybridizes first with the L2 toehold. Toehold hybridization propels the unzipping of L2 from SA1 and SA2, which eliminates the crosslink and reduces the gel stiffness. In this report and video, step-by-step instructions are provided for the preparation of stiffening and softening DNA gels. While 100% and 80% gel preparations are described, this protocol can be tailored to create DNA gels of other initial and final crosslinked percentages. In general, 100% and 80% gels are prepared, immobilized onto glass cover slips, functionalized, and seeded with cells. L2 is added to the media of 80% gels and R2 is added to the media of 100% gels, 48 hr after plating. The addition of L2 to media stiffens 80% gels to 100% crosslinked, whereas the addition of R2 to media softens 100% gels to 80% crosslinked. Stiffened gels are designated as 80→100% gels and softened gels are designated as 100→80% gels in the text. For control or static gels, ssDNA consisting of Ts or As is delivered to another set of 100% and 80% gels. After a minimum of two days following elasticity modulation, cells can be processed and analyzed. L2 30 TCA TTC TGA CGC AAA GGT GCG CTA CAC TTG 56 A 10 bp toehold sequence is included. L2 40 TCT GAT TGG GAA ACA GTC CTA TGC CAC GGT TAC CTT CAT C 65.9 A 12 bp sequence toehold is included. L2 40 TCC AGT CGT CCC TAA GCA TGG ACA TTG CAT ACA CCT CCG T 68.8 Toehold is not included. Table 1. Base sequences for ssDNA 9-11,13,14,18,21. Cellular and mechanical studies have utilized several different crosslink designs to generate DNA gels with a range of static and dynamic mechanical properties. The parameters modulated in crosslink design are base sequence and sequence length or crosslink length. Bold and italicized fonts illustrate base pairing between SA1 and L2 and between SA2 and L2, respectively. Table 2. Young’s modulus (E) of DNA gels 9-11,13,14,18,21. Acrylamide concentration, crosslink percentage, and crosslink length can be modulated in DNA gels. Designs 1, 2, and 3 have 20, 28, and 40 bp crosslink lengths, respectively. 100% gels for all designs have similar moduli indicating crosslink length does not affect gel elasticity. However, variations in acrylamide concentration alter DNA gel elasticity. NOTE: The entire protocol from gel preparation to cell processing takes a minimum of six days. Estimated time for gel preparation is 8 hr plus an O/N incubation. Estimated time for gel immobilization and DNA annealing is 8 hr plus an O/N rinsing step. Estimated time for gel functionalization is 2 hr. Time for cell plating and growth is dependent on culture type and application, but a minimum of four days is required. NOTE: Prepare DNA gels in three distinct steps. First, individually polymerize SA1 and SA2 ssDNA into a PA backbone. These solutions are called SA1 polymerized solution and SA2 polymerized solution, respectively (§1.1). Second, dissolve the crosslinker, reversible strand, and control ssDNAs. Dissolve the lyophilized L2 ssDNA (crosslinker). This is called 100% L2 solution and is used to fabricate 100% gels (§1.2). Dilute an aliquot of 100% L2 solution to 80%. This is called 80% L2 solution and is used to fabricate 80% gels. Dissolve lyophilized R2 (reversible strand) and control ssDNA to use in §4. Third, mix SA1 polymerized solution, SA2 polymerized solution, and 100% or 80% L2 solution in a ratio of 10:10:6 (SA1:SA2:L2) to form 100% and 80% gels, respectively. (§1.3). Select and order the appropriate SA1, SA2, L2, and R2 base sequences from Tables 1 and 2. Base sequences and sequence length were optimized in previous reports 9-11,13,14. Calculate all solution formulations (Tables 3-4). NOTE: Meticulously document calculations for troubleshooting purposes. Construction of an Excel template is recommended and can be used repeatedly for DNA gel preparation. Please see Tables 3 and 4 for an example of the tabulation for Design 2 (Tables 1 and 2). The volumes specified in Table 4 will be used throughout this protocol but volumes will vary with every aliquot of lyophilized ssDNA. Table 3. Percentage of solutions for fabricating SA1 or SA2 polymerized solutions. The first column shows the solutions for formulating the DNA gels. The second column shows the stock concentrations of these solutions. The third column shows the percentage of the stock solutions in SA1 or SA2 polymerized solutions (v/v). The last column reflects the final concentrations in SA1 and SA2 solutions. SA1 solution 320.7 nmol of lyophilized SA1 ssDNA 3.00 mM 320.7 nmol / 3.00 nmol μl-1 = 107 µl 107 µl of TE buffer to lyophilized ssDNA SA1 solution is 60% of SA1 polymerized solution. 178 µl is the total volume of SA1 polymerized solution (Table 3). SA2 solution 324.4 nmol of lyophilized SA2 ssDNA 3.00 mM 324.4 nmol / 3.00 nmol μl-1 = 108 µl 108 µl of TE buffer to lyophilized ssDNA SA2 solution is 60% of SA2 polymerized solution. 180 µl is the total volume of SA2 polymerized solution (Table 3). SA1 polymerized solution 40% acrylamide 10% 178 µl x 0.25 = 44.5 µl 45 µl Calculate the amount of acrylamide, TBE, APS, and TEMED based on a total volume of 178 µl (see above and Table 3). 100% SA1 solution 60% — 107 µl SA1 solution is 60% of the SA1 polymerized solution (see above and Table 3). 2% APS 0.05% 178 µl x 0.025 = 4.45 µl 4.5 µl Add and mix APS before adding TEMED. SA2 polymerized solution 40% acrylamide 10% 180 µl x 0.25 = 45 µl 45 µl Calculate the amount of acrylamide, TBE, APS, and TEMED based on a total volume of 180 µl (see above and Table 3). 100% SA2 solution 60% — 108 µl SA2 solution is 60% of the SA2 polymerized solution (see above and Table 3). 100% Gel solution 100% SA1 polymerized solution 10 parts — 10 µl Compose 100% gels with the following SA1:SA2:L2 ratio, 10:10:6. 80% Gel solution 100% SA1 polymerized solution 10 parts — 10 µl Compose 80% gels with the following SA1:SA2:L2 ratio, 10:10:6. 80→100% gel 80% gel 100% gel Calculation 1: 1 µl of 100% L2 solution into culture media Calculations are based on having 20 µl gels on cover slips. First, convert the parts of 100% L2 solution in the 20 µl of gel into µl. Second, calculate the amount (in µl) of 100% L2 solution needed for an additional 20% of crosslinking. Add this amount of 100% L2 solution to gel. 100→80% gel 100% gel 80% gel Calculation 1: 1 µl of 100% R2 solution into culture media Calculations are based on having 20 µl gels on cover slips. First, convert the parts of 100% L2 solution in the 20 µl of gel into µl. Second, calculate the amount (in µl) of 100% L2 solution needed to be removed to compose a 20% gel. Add this amount of R2 solution to gel. 100% gel (Control) 100% gel 100% gel — 1 µl of control solution into culture media Amount of control solution is equivalent to the amount of R2 solution added. 80% gel (Control) 80% gel 80% gel — 1 µl of control solution into culture media Amount of control solution is equivalent to the amount of 100% L2 solution added. Table 4. Example calculations for DNA gel preparation. Mock numbers are provided to illustrate the calculations for the preparation of 80%, 100%, 100→80%, and 80→100% gels. DNA gels are Design 2 in Table 1. Centrifuge lyophilized SA1 ssDNA at 2,000 x g for 15 sec to ensure all ssDNA is at the bottom of the vial. NOTE: Proper concentration of SA1 solution is critical for DNA gel synthesis. Prepare 3 mM of SA1 solution by adding 107 µl of 1x Tris-EDTA, pH 8.0 buffer (TE buffer) to the vial (Tables 3-4). Heat SA1 in TE buffer at 70 °C for 5 min or until ssDNA pellet is completely dissolved. NOTE: Heating temperature should be a minimum of 5 °C above melting temperature (Tm) to ensure DNA is in a single-stranded state. Prepare SA1 polymerization solution by adding 40% acrylamide and 10x Tris-Borate-EDTA (TBE) buffer at the indicated percentages (Table 3). In this example, add 45 and 18 µl, respectively, to 107 µl of SA1 solution (Table 4). Degas with nitrogen gas for 3 min to facilitate mixing. Insert a p200 tip attached to a nitrogen gas source into the solution and slowly allow nitrogen gas to pass through the solution. Test the flow rate of nitrogen gas in water prior to degassing SA1 solution to prevent splatter. Centrifuge for 15 sec at 2,000 x g to gather solution. Add 4.5 µl of 2% ammonium persulfate (APS, Tables 3-4) to initiate gel polymerization. Invert the tube several times to mix. Centrifuge for 15 sec at 2,000 x g to gather solution for homogenous polymerization. Add 4.5 µl of 20% tetramethylethylenediamine (TEMED, Tables 3-4) to catalyze polymerization. Degas with nitrogen gas for 3-5 min to complete polymerization and minimize un-reacted monomers. Incubate solution for 10 min at RT to complete polymerization. NOTE: This solution is called SA1 polymerized solution. Repeat steps 1.1.3-1.1.16 with lyophilized SA2 ssDNA, but add 45, 18, 4.5, and 4.5 µl of acrylamide, TBE, APS, and TEMED, respectively, to 108 µl of SA2 solution (Tables 3-4). NOTE: SA1 and SA2 polymerized solutions can be stored at 4 °C for up to one month. Repeat steps 1.1.3-1.1.5 with lyophilized R2 ssDNA but add 64.4 µl of TE buffer (Table 4). Repeat steps 1.1.3-1.1.5 with lyophilized control ssDNA but add 111 µl of TE buffer (Table 4). Repeat steps 1.1.3-1.1.5 with lyophilized L2 ssDNA but add 219 µl of TE buffer (Table 4). NOTE: This is 100% L2 solution. Adding 100% L2 solution to SA1 and SA2 polymerized solutions (see §1.3) will form a 100% crosslinked DNA gel (100% gel) because SA1, SA2, and L2 will be stoichiometrically equivalent. Dilute an aliquot of 100% L2 solution to 80% by adding 20 µl of 1x TE buffer to 80 µl of 100% L2 solution (Table 4). NOTE: This solution is 80% L2 solution. Adding 80% L2 solution to SA1 and SA2 polymerized solutions (see §1.3) will form an 80% crosslinked DNA gel (80% gel) because only 80% of SA1 and SA2 will be crosslinked to L2. Solutions can be stored at 4 °C for up to one month. Heat SA1 and SA2 polymerized solutions at 70 °C until solution viscosity is reduced (about 1 min). Raise the temperature up to 80 °C if solution is still too viscous to pipette. Add 10 µl or 10 parts of SA1 polymerized solution to 10 µl or 10 parts of SA2 polymerized solution (Table 4). NOTE: SA1 and SA2 polymerized solutions are extremely viscous and difficult to pipette. Since concentrations are critical to gel formation, use a positive-displacement pipette from this point forward or see discussion for other handling techniques. Also, pipette in multiple, small aliquots (>20 µl) rather than a single, large volume. Mix SA1 and SA2 polymerized solutions together via alternating heating (for 15 sec at 70 °C) and stirring (for 15 sec with a pipette tip) for a total of 1 min. Add 6 µl or 6 parts of 100% L2 solution to form a 100% gel (Table 4). Mix by alternating heating and stirring as described in step 1.3.3. Heat gel for 1 hr at the optimal annealing temperature (35 °C). Calculate annealing temperature by subtracting 5 °C from the ssDNA sequence with the lowest melting temperature (Table 1). Pipette the 100% gel into a 60-mm Petri dish. Allow DNA crosslinks to continue to rehybridize by incubating gel for 4 hr at RT. Cover gel with PBS containing calcium and magnesium and incubate O/N at RT. NOTE: Gels will swell about 3 times their initial volume. In addition, gels will equilibrate with buffer and excess acrylamide will diffuse out of the gels. Calcium and magnesium in the PBS stabilize DNA hybridization and prevent gel bursting (see Discussion for toubleshooting gel bursting). Remove remaining buffer from Petri dish. To fabricate 80% gels, repeat steps 1.3.1-1.3.10 but replace 100% L2 solution in step 1.3.4 with 80% L2 solution. Store 100% and 80% gels at 4 °C for up to one month. NOTE: The stiffness differences between 80% and 100% gels are physically distinguishable. NOTE: Immobilize aliquots of 100% or 80% gels onto glass cover slips (Figure 2). Heat 100% gel at 70 °C for about 30 sec or until gel is less viscous for pipetting. Place glass cover slips onto a 70 °C heat block and allow to heat for 1-2 min. Add a drop of optical adhesive to each glass cover slip. Add 20 µl of 100% gel to each glass cover slip (Table 4). NOTE: 10-30 µl can be dispensed on each cover slip. Allow gel to melt and spread over glass cover slip. NOTE: If gel topology does not appear even after melting, flatten gel with a siliconized glass cover slip. However, additional swelling will occur in subsequent steps and contribute to gel unevenness. Remove glass-containing gel from heat block and place into a 24-well tissue culture dish. Repeat steps 2.1-2.6 with 80% gel. Heat gels for 1 hr at the optimal annealing temperature (35 °C). NOTE: It is normal for gels to become dry and this will be resolved when gels are incubated in PBS. Expose plates containing 80% and 100% gels to ultraviolet (UV, 365 nm) light for 15 min. NOTE: UV exposure simultaneously cures glue and sterilizes gels. If a UV crosslinking chamber is not available, gels can be placed under a UV light that is equipped in a biological safety cabinet. After UV exposure, perform subsequent steps of this protocol under a biological safety cabinet to maintain gel sterility. Also, use sterile solutions from this point forward. Allow DNA crosslinks to rehybridize at RT for 4 hr. Add PBS and incubate O/N at 4 °C. NOTE: PBS incubation rinses, equilibrates, and swells gels again because repeated heating can dehydrate the gels. Figure 2. Schematic of gel immobilization and functionalization. After DNA gels (grey) are prepared, gels are attached to glass cover slips (white) by optical glue (green). Gels are simultaneously cured and sterilized by UV light. After swelling, gels are approximately 1-mm thick. Next, gels are functionalized in a two-step process (red outlined box). First, sulfo-SANPAH is conjugated to acrylamide on the gel surfaces by UV light exposure. Second, gels are incubated with collagen or poly-D-lysine, which attaches to the sulfo-N-hydroxysuccinimide ester in sulfo-SANPAH. This figure has been modified from 10. NOTE: DNA gel functionalization is required for cell adhesion since polyacrylamide gels are inert materials (Figure 2). In this section, gels will be functionalized in two-steps. First, N-Sulfosuccinimidyl-6-(4'-azido-2'-nitrophenylamino) hexanoate or sulfo-SANPAH will be covalently linked by photolysis of nitrophenyl azide group to the polyacrylamide backbone of the DNA gels. Second, primary amines in collagen or poly-D-lysine will attach to the sulfo-N-hydroxysuccinimide ester in sulfo-SANPAH to attach the proteins to the gel surface. Remove buffer in wells with a pipette and be careful not to aspirate the gel. NOTE: Do not perform vacuum aspiration to reduce the probability of aspirating the gel. Optional) Wash gels thrice for 15 min at RT to remove excess acrylamide monomer, TEMED, and APS. Add about 300 µl of sulfo-SANPAH to cover each gel. Expose gels to UV (365 nm) for 5 min. Rinse gels once with PBS to remove excess sulfo-SANPAH. Incubate gels in about 300 µl of 0.2 mg/ml of poly-D-lysine for 1 hr at RT or O/N at 4 °C. NOTE: Alternatively, incubate gels with 0.2 mg/ml of collagen type 1 O/N at 4 °C. Wash gels twice with PBS for 5 min to remove excess poly-D-lysine. Incubate gels in about 300 µl of media for 30 min to equilibrate gels. Remove media immediately before plating cells. NOTE: In this section, we provide details regarding the softening or stiffening of gels after cell plating. A detailed cell culturing protocol is not provided for several reasons. First, numerous cell types can adhere onto DNA gels and each cell type will require specific adjustments by the researcher for cell plating. Second, standard cell and tissue culturing techniques are used for these experiments and can be found in numerous original articles, technical articles, and reference books. Techniques for specifically plating fibroblasts and neurons onto DNA gels can be found in previous publications 9-11,19-21. Plate cells. For protocols regarding dissection and/or culturing of neurons or fibroblasts mentioned in this article, refer to one of the following publications 9-11,19-21. After a minimum of 48 hr, modulate gel stiffness by pipetting 1 µl of control, L2, or R2 solution close to the gel (Table 4). To stiffen gels from 80% to 100% crosslinked (80→100% gels), add the remaining 20% of L2 to 80% gels by adding 1 µl of 100% L2 solution close to the gel. To soften gels from 100% to 80% crosslinked (100→80% gels), add R2 to remove 20% of the crosslinks from 100% gels by adding 1 µl of 100% R2 solution close to the gel. For controls, add equal volumes of control solution to a subset of 100% and 80% gels by adding 1 µl of control solution close to the gel. Perform the desired cell processing and data analysis after a minimum of 48 hr. Prior to our studies, cell-ECM interactions were observed on static compliant biomaterials or on irreversible and unidirectional dynamic substrates. These substrates do not accurately reflect the dynamic nature of the cellular microenvironment. Our work shifts the existing technical paradigms by providing a more physiologic model for studying cell-ECM interactions on softening and stiffening dynamic biomaterials. In previous studies, we analyzed the effects of dynamic substrates on cells by examining various cell morphologies and phenotypes on these gels. In one example, we determined the effects of substrate stiffening on fibroblasts by evaluating fibroblast morphology on dynamic DNA gels. L929 cells, a mouse-derived fibroblast cell line, were plated on 80% and 100% gels (Figure 3) 11. Two days after plating, 20% additional L2 solution was added to media of 80% gels to stiffen the gels to 100% crosslinked (80→100%, center panel). 100% gels and another set of 80% gels received control ssDNA to remain static (right and left panel, respectively). Light microscopy images were captured two days after delivery of DNA to the media. Image blurriness, as seen in Figure 3, was due to gel surface unevenness and is typical and unavoidable. Gel swelling and contraction, resulting from the addition of buffers and L2 18,21, contributes to gel unevenness. Morphology was evaluated with ImageJ software (NIH, Bethesda, MD) and served as an indicator of function. 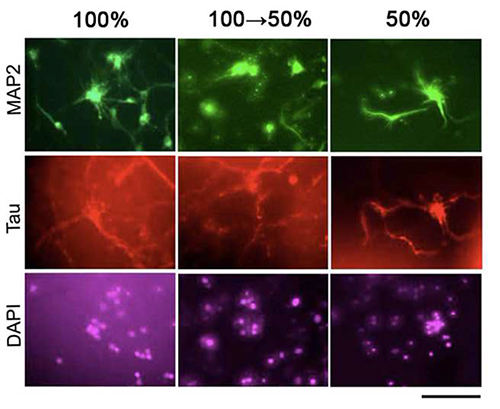 Fibroblasts grown on stiffening gels (80→100%) had no alterations in aspect ratio, but exhibited a larger projection area than fibroblasts grown on 100% gels 11. Interestingly, the morphology of fibroblasts grown on static gels was dissimilar to the morphology of fibroblasts grown on dynamic gels. Fibroblasts grown on 100% gels had a smaller projection area and larger aspect ratio than fibroblasts grown on 80% gels. These results indicate that fibroblast behavior is dependent on the dynamic nature of the microenvironment. In another study, the effects of substrate softening on neurons was determined by analyzing neuronal phenotypes including dendrite number, dendrite length, and axon length (Figure 4) 10. 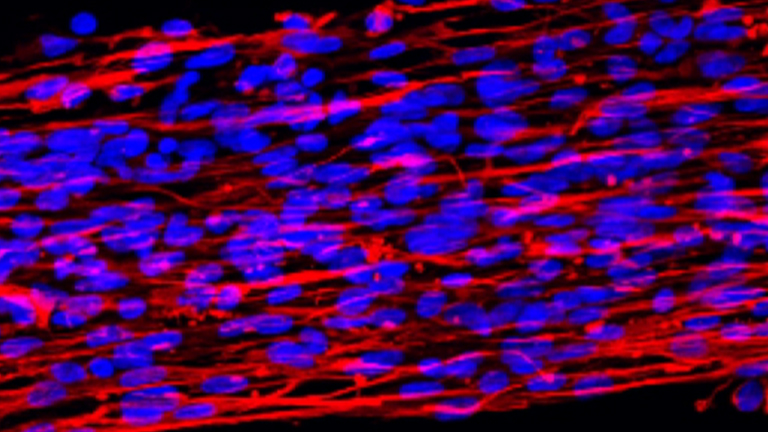 Rat-derived spinal cord neurons were grown on 100% and 50% gels. Four days after plating, 50% R2 was added to the media of 100% gels to soften the gels to 50% crosslinked (100→50%, center panels). 50% gels and another set of 100% gels received control ssDNA to remain static (right and left panels, respectively). After three days, neurons were fixed and immunostained with a dendritic marker (MAP2, top panels), an axonal marker (Tau, middle panels), and nuclei (DAPI, bottom panels) to evaluate phenotypes. 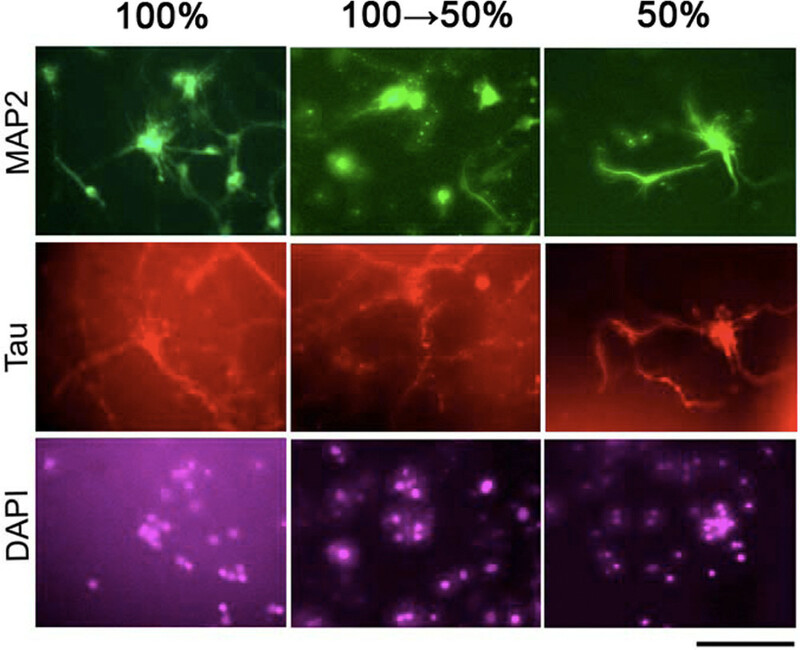 Neurons grown on softening gels (100→50%) had no differences in primary dendrite number or axon length, but exhibited shorter primary dendrites than neurons grown on 50% gels. As in fibroblast studies, neural phenotypes on static gels were dissimilar to neural phenotypes on dynamic gels. Neurons grown on 50% gels had fewer primary dendrites and longer axons than neurons grown on 100% gel. In conclusion, fibroblast and neuron images demonstrate that multiple cell types can be studied on dynamic and static DNA gels, DNA gel unevenness causes imaging challenges, standard morphological and immunostaining techniques are feasible, and most importantly the behavior of cells is dependent on substrate dynamics. Figure 3. Fibroblasts grown on static and dynamic DNA gels. Representative light microscopy images of L929 fibroblasts grown on 80% (left panel), 80→100% (center panel), and 100% gels (right panel). Scale bar is 100 μm. This figure has been modified from 11. Please click here to view a larger version of this figure. Figure 4. Neurons grown on DNA gels. Representative fluorescent images of spinal cord neurons grown on 100% (left panels), 100→50% (center panels), and 50% (right panels) gels. MAP2 immunostaining indicates dendrites (top panels), Tau-1 immunostaining indicates axons (middle panels), and DAPI staining indicates nucleus (bottom panels). Scale bar is 100 μm. This figure has been modified from 10. Please click here to view a larger version of this figure. The ability of DNA gels to soften or stiffen before and after cell adhesion makes them an ideal model to study the role of dynamic tissue stiffness on cell function. All three designs have been used in mechanical and biological studies. However, all three designs have similar elasticities at various crosslink percentages, indicating crosslink length does not influence DNA gel elasticity (Table 2). In contrast, acrylamide concentration affects elasticity. These designs may differ in crosslinking kinetics since gel bursting tendencies, or the tendency of gels to dissolve in media or buffer, decreases with increasing crosslink length. However kinetic information on DNA gels is limited, but we do know an additional 30% of crosslinking occurs two days after L2 delivery to 50% DNA gels 11. Nevertheless, the generation of expansive and contractile forces from gel softening and stiffening, respectively, is unavoidable and cannot be decoupled 18,21. 100→70% gels generate about 0.5 Pa of stress 21, while 50→100% gels only generate about 0.04 Pa of stress since more energy is required to form bonds among the three stands of ssDNA 18. Therefore, the interpretation of results requires the consideration of stress and strain generated by the stiffening and softening of gels. Technical challenges can arise when preparing DNA gels. The most frequent technical issue is gel bursting. Gel bursting can occur during several stages of DNA gel preparation including gel swelling, storage, and cell growth. Gel bursting is caused by multiple factors. First, gel bursting can be a result of improper solution composition. Common errors include insufficient dissolving of lyophilized ssDNA and improper pipetting of the viscous liquids. To avoid pipetting errors, raise the heating temperature to reduce gel viscosity for easier pipetting of solutions or aliquot the required amount of SA1 and SA2 polymerized solution prior to the second nitrogen bubbling step. Also, repeated heating of the polymerized solutions can partially evaporate the solution and increase solution viscosity. Adding a few microliters of TE buffer can help to reduce the viscosity. Second, gel bursting can be a result of poor DNA quality. QA/QC reports must be reviewed frequently. If QA/QC reports are acceptable and gel bursting still occurs, HPLC purified ssDNA can improve DNA quality. Third, gel bursting can result from insufficient DNA annealing. We have reduced the incidence of gel bursting by including annealing steps and rehybridization steps in the original protocol (see steps 1.3.6 and 2.8; 1.3.8 and 2.10, respectively). Gel bursting might be prevented by extending annealing and cooling times. However, additional exposure to heat can evaporate water to cause an increase in gel detachment from glass when gels are re-swelled. If detachment is excessive for any annealing time, the annealing steps can be eliminated (1.3.6 and 2.8). Another frequent technical problem encountered is insufficient cell adhesion. The swollen gels are softer than the unswollen gels (Table 2) 18 making cell adhesion difficult. Furthermore, since each cell type responds differently to tissue stiffness, some cell types may experience this technical dilemma while other cell types do not. To resolve adhesion issues some of the follow steps should be considered: (1) use a high plating density, (2) alternate the ECM proteins conjugated to sulfo-SANPAH, (3) modulate the stiffness parameters, (4) increase ECM protein or sulfo-SANPAH concentration, and (5) increase incubation times. Residual toxic agents such as acrylamide monomer, APS, and TEMED could also contribute to lack of adhesion and cell death on gels. We have not experienced this issue since extensive washes incorporated into the protocol have proven sufficient, but we recommend performing Optional Step 3.2 if this issue occurs. DNA gels can be utilized to more effectively study a variety of cell functions under dynamic or static conditions. We have shown that fibroblasts and neurons grown on DNA gels are affected by the modulation of gel elasticity. Since cell-matrix interactions are typically three-dimensional interfaces, information from three-dimensional dynamic matrix studies will help to produce more biologically relevant data. Therefore, we are currently translating this technology into a three-dimensional scaffold. We are developing a technique that replaces the polyacrylamide backbone with a more biocompatible material, while maintaining the DNA crosslinking technology. This new scaffold will serve as a three-dimensional, dynamic model and a tissue-engineering scaffold. Its biocompatibility will open opportunities for medical device applications. The authors would like to thank: Dr. Frank Jiang, Dr. David Lin, Dr. Bernard Yurke and Dr. Uday Chippada for their contributions on developing the DNA gel technology; Dr. Norell Hadzimichalis, Smit Shah, Kimberly Peterman, Robert Arter for their comments and edits of this manuscript; funding sources including the New Jersey Commission on Spinal Cord Research (Grant #07A-019-SCR1, N.A.L.) and New Jersey Neuroscience Institute (M.L.P. ); and publishers of Tissue Engineering, Part A for permission to reprint Figures 2 and 4 and Biomaterials for permission to reprint Figure 3.
idtdna.com Do not vortex ssDNA. Gentle invert the vial and/or pipette solution to mix. PBS with calcium and magnesium Any brand. 10x Tris-Borate-EDTA buffer (TBE buffer) Sigma-Aldrich (St. Loius, MO) 93290 TBE is a reproductive toxin. 40% Acrylamide solution Fisher Scientific (Pittsburg, PA) BP14021 Acrylamide is a toxin. Ammonium persulfate (APS) Sigma-Aldrich (St. Loius, MO) A3678 Prepare a 2% solution in TE buffer. APS is a toxin and irratant. Tetramethylethylenediamine (TEMED) Sigma-Aldrich (St. Loius, MO) T9281 Prepare a 20% solution in TE buffer. TEMED is flammable, a corrosive, and a toxin. 24-well tissue culture plate Any brand. proteochem.com or thermofisher.com C111 or 22589 Prepare a 0.315 mg/ml solution in water immediately before use. Dissolve at 37 °C and filter sterilze. It is normal to observe undisolved sulfo-SANPAH in the filter. Sulfo-SANPAH is light sensitive and, therefore, the solution should be protect from light until UV exposure. Poly-D-Lysine (PDL) Sigma-Aldrich (St. Loius, MO) P6407 Prepare a 0.2 mg/ml solution in water and filter sterilize. affymetrix.com 13813 Prepare a 0.2 mg/ml solution in 0.2 N acetic acid. Solution needs to remain cold at all times to avoid polymerization. Acetic acid is a flammable, toxic, and corrosive. UV light source Place gels as close as possible to the UV light. UV light can cause skin or eye injury. Balaban, N. Q., et al. Force and focal adhesion assembly A close relationship studied using elastic micropatterned substrates. Nat Cell Biol. 3, (5), 466-472 (2001). Peppas Brannon-Peppas, L., Peppas, N. A. Dynamic and equilibrium swelling behaviour of ph-sensitive hydrogels containing 2-hydroxyethyl methacrylate. Biomaterials. 11, (9), 635-644 (1990). Charati, M. B., Ifkovits, J. L., Burdick, J. A., Linhardt, J. G., Kiick, K. L. Hydrophilic elastomeric biomaterials based on resilin-like polypeptides. Soft Matter. 5, (18), 3412-3416 (2009). Davis, K. A., Burke, K. A., Mather, P. T., Henderson, J. H. Dynamic cell behavior on shape memory polymer substrates. Biomaterials. 32, (9), 2285-2293 (2011). Dembo, M., Wang, Y. L. Stresses at the cell-to-substrate interface during locomotion of fibroblasts. Biophys J. 76, (4), 2307-2316 (1999). Gray, D. S., Tien, J., Chen, C. S. Repositioning of cells by mechanotaxis on surfaces with micropatterned youngs modulus. J Biomed Mater Res A. 66, (3), 605-614 (2003). Homma, M., Seida, Y., Nakano, Y. Effect of ions on the dynamic behavior of an electrodriven ionic polymer hydrogel membrane. Journal of applied Polymer Science. 82, (1), 76-80 (2001). Horkay, F., Tasaki, I., Basser, P. J. Osmotic swelling of polyacrylate hydrogels in physiological salt solutions. Biomacromolecules. 1, (1), 84-90 (2000). Jiang, F. X., Yurke, B., Firestein, B. L., Langrana, N. A. Neurite outgrowth on a DNA crosslinked hydrogel with tunable stiffnesses. Ann Biomed Eng. 36, (9), 1565-1579 (2008). Jiang, F. X., Yurke, B., Schloss, R. S., Firestein, B. L., Langrana, N. A. Effect of dynamic stiffness of the substrates on neurite outgrowth by using a DNA-crosslinked hydrogel. Tissue Engineering Part A. 16, (6), 1873-1889 (2010). Jiang, F. X., Yurke, B., Schloss, R. S., Firestein, B. L., Langrana, N. A. The relationship between fibroblast growth and the dynamic stiffnesses of a DNA crosslinked hydrogel. Biomaterials. 31, (6), 1199-1212 (2010). Kloxin, A. M., Tibbitt, M. W., Anseth, K. S. Synthesis of photodegradable hydrogels as dynamically tunable cell culture platforms. Nat Protoc. 5, (12), 1867-1887 (2010). Lin, D. C., Yurke, B., Langrana, N. A. Mechanical properties of a reversible, DNA-crosslinked polyacrylamide hydrogel. J Biomech Eng. 126, (1), 104-110 (2004). Lin, D. C., Yurke, B., Langrana, N. A. Use of rigid spherical inclusions in young's moduli determination: Application to DNA-crosslinked gels. J Biomech Eng. 127, (4), 571-579 (2005). Luo, Y., Shoichet, M. S. Light-activated immobilization of biomolecules to agarose hydrogels for controlled cellular response. Biomacromolecules. 5, (6), 2315-2323 (2004). Marklein, R. A., Burdick, J. A. Spatially controlled hydrogel mechanics to modulate stem cell interactions. Soft Matter. 6, (1), 136-143 (2010). Pelham Jr, R. J., Wang, Y. Cell locomotion and focal adhesions are regulated by substrate flexibility. Proc Natl Acad Sci U S A. 94, (25), 13661-13665 (1997). Previtera, M. L., Chippada, U., Schloss, R. S., Yurke, B., Langrana, N. A. Mechanical properties of DNA-crosslinked polyacrylamide hydrogels with increasing crosslinker density. BioResearch Open Access. 1, (5), 256-259 (2012). Previtera, M. L., Langhammer, C. G., Firestein, B. L. Effects of substrate stiffness and cell density on primary hippocampal cultures. J Biosci Bioeng. 110, (4), 459-470 (2010). Previtera, M. L., Langhammer, C. G., Langrana, N. A., Firestein, B. L. Regulation of dendrite arborization by substrate stiffness is mediated by glutamate receptors. Ann Biomed Eng. 38, (12), 3733-3743 (2010). Previtera, M. L., Trout, K. L., Verma, D., Chippada, U., Schloss, R. S., Langrana, N. A. Fibroblast morphology on dynamic softening of hydrogels. Ann Biomed Eng. 40, (5), 1061-1072 (2012). Saxena, T., Gilbert, J., Stelzner, D., Hasenwinkel, J. Mechanical characterization of the injured spinal cord after lateral spinal hemisection injury in the rat. J Neurotrauma. 29, (9), 1747-1757 (2012). Sundararaghavan, H. G., Monteiro, G. A., Firestein, B. L., Shreiber, D. I. Neurite growth in 3d collagen gels with gradients of mechanical properties. Biotechnol Bioeng. 102, (2), 632-643 (2009). Wozniak, M. A., Chen, C. S. Mechanotransduction in development A growing role for contractility. Nat Rev Mol Cell Biol. 10, (1), 34-43 (2009). Wuerfel, J., et al. Mr-elastography reveals degradation of tissue integrity in multiple sclerosis. Neuroimage. 49, (3), 2520-2525 (2012). Zaari, N., Rajagopalan, P., Kim, S. K., Engler, A. J., Wong, J. Y. Photopolymerization in microfluidic gradient generators Microscale control of substrate compliance to manipulate cell response. Adv Mater. 16, (23-24), 2133-2137 (2004).